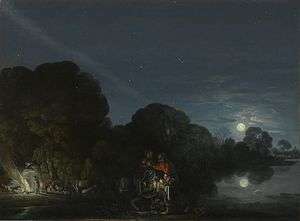 For other uses, see Flight into Egypt (disambiguation). The flight into Egypt is a biblical event described in the Gospel of Matthew (Matthew 2:13-23), in which Joseph fled to Egypt with Mary and infant son Jesus after a visit by the Magi, because they learned that King Herod intended to kill the infants of that area. The episode is frequently shown in art, as the final episode of the Nativity of Jesus in art, and was a common component in cycles of the Life of the Virgin as well as the Life of Christ. When the Magi come in search of Jesus, they go to Herod the Great in Jerusalem and ask where to find the newborn "King of the Jews". Herod becomes paranoid that the child will threaten his throne, and seeks to kill him (2:1-8). Herod initiates the Massacre of the Innocents in hopes of killing the child (Matthew 2:16-Matthew 2:18). But an angel appears to Joseph and warns Joseph to take Jesus and his mother into Egypt (Matthew 2:13). After a time Joseph and the others return from Egypt, the text stating that their enemies had died. Herod is believed to have died in 4 BC, and while Matthew does not mention how, the Jewish historian Josephus vividly relates a gory death. The land they return to is identified as Israel, the only place in the entire New Testament where Israel unambiguously acts as a geographic description of the whole of Judah and Galilee Matthew 2:20, rather than as referring to a collection of religious people or the Jewish people in general. It is however to Judah that they are described as initially returning, although upon discovering that Archelaus had become the new king of Judah, they went instead to Galilee. Historically, Archelaus was such a violent and aggressive king that in the year 6 AD he was deposed by the Romans, in response to complaints from the population. Galilee was ruled by a much calmer king, Herod Antipas, and there is historical evidence that Galilee had become a refuge for those fleeing the iron rule of Archelaus. "... and out of Egypt I called My son". Matthew's use of Hosea 11:1 has been explained in several ways. A sensus plenior approach states that the text in Hosea contains a meaning intended by God and acknowledged by Matthew, but unknown to Hosea. A typological reading interprets the fulfillment as found in the national history of Israel and the antitypical fulfillment as found in an event in the personal history of Jesus. Matthew's use of typological interpretation may also be seen in his use of Isaiah 7:14 and 9:1, and Jeremiah 31:15. "Israel is my first-born son; let my son go, that he may serve me" (Exodus 4:22-23). The Massoretic Text reads my son, whereas the Septuagint reads his sons or his children; the Massoretic Text is to be preferred, the singular being both consonant with the other words which are in the singular in Hosea 11:1 and with the reference to Exodus 4:22-23. The Septuagint reading may be explained as having been made to conform to the plurals of Hosea 11:2, they and them. See also Hermeneutics and Jewish exegesis. Russian icon of the Flight into Egypt; the bottom section shows the idols of Egypt miraculously falling down before Jesus and being smashed (17th century). 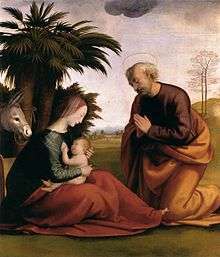 Matthew's story was much elaborated in the New Testament apocrypha, with, for example, palm trees bowing before the infant Jesus, the beasts of the desert paying him homage, and an encounter with the two thieves who would later be crucified alongside Jesus. In these later tales the family is joined by Salome as Jesus' nurse. These stories of the time in Egypt have been especially important to the Coptic Church, which is based in Egypt, and throughout Egypt there are a number of churches and shrines marking places where the family stayed. The most important of these is the church of Abu Serghis, which claims to be built on the place the family had its home. The Gospel of Luke does not recount this event, relating instead that the Holy Family went to the Temple in Jerusalem, and then directly home to Nazareth. Followers of the liberal and unorthodox Jesus Seminar thus conclude that both Luke's and Matthew's birth and infancy accounts are fabrications. 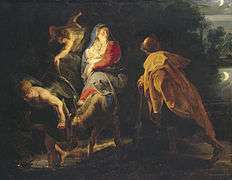 A theme of Matthew is likening Jesus to Moses for a Judean audience, and the Flight into Egypt illustrates just that theme. 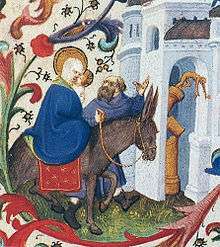 The Flight into Egypt was a popular subject in art, showing Mary with the baby on a donkey, led by Joseph, borrowing the older iconography of the rare Byzantine Journey to Bethlehem. 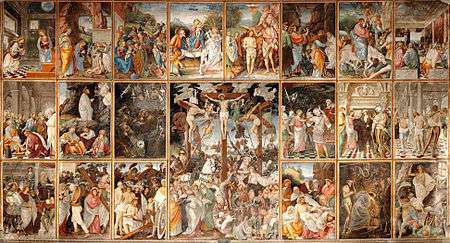 Before about 1525, it usually formed part of a larger cycle, whether of the Nativity, or the Life of Christ or Life of the Virgin. 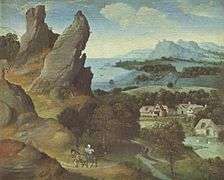 During the 16th century, as interest in landscape painting grew, the subject became popular as an individual subject for paintings, often with the figures small in a large landscape. The subject was especially popular with German Romantic painters, and later in the 19th century was one of a number of New Testament subjects which lent themselves to Orientalist treatment. Unusually, the 18th century artist Gianbattista Tiepolo produced a whole series of etchings with 24 scenes from the flight, most just showing different views of the Holy Family travelling. 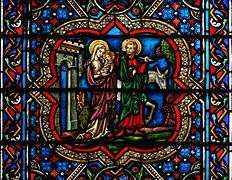 A subject taking place after the arrival in Egypt is the meeting of the infant Jesus with his cousin, the infant John the Baptist, who, according to legend was rescued from Bethlehem before the massacre by the Archangel Uriel, and joined the Holy Family in Egypt. This meeting of the two Holy Children was to be painted by many artists during the Renaissance period, after being popularized by Leonardo da Vinci and then Raphael with works like Leonardo's Virgin of the Rocks. 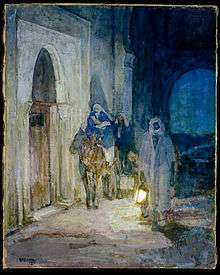 The "Flight into Egypt" was a favorite theme of Henry Ossawa Tanner, depicting the Holy Family's clandestine evasion of King Herod's assassins (Matthew 2:12–14). In it Tanner expresses his sensitivity to issues of personal freedom, escape from persecution, and migrations of African-Americans from the South to the North. Two plays of the medieval Ordo Rachelis cycle contain an account of the flight into Egypt, and the one found in the Fleury Playbook contains the only dramatic representation of the return from Egypt. The oratorio L'enfance du Christ (1854) by French composer Hector Berlioz relates the events from Herod's dream and his meeting with the Magi through the angels' warning and the flight into Egypt until the Holy Family arrive at Sais. While Luke places Jesus' family as being originally from the town of Nazareth, Matthew has the family moving there, fearing Archelaus who was ruling in Judea in place of his father Herod. 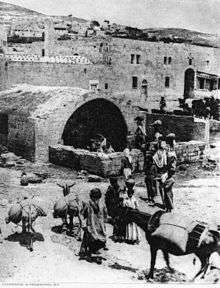 Nazareth, now a town, is not mentioned by the Old Testament, Josephus or rabbinical sources, though many Christian Bible archaeologists, such as the evangelical and egyptologist Kenneth Kitchen, state that they are fairly sure that a village existed in the area at the time of Jesus. Clarke notes that the location of Nazareth is just to the north of where the large town Sepphoris was located. At the time, Sepphoris had been largely destroyed in the violence following the death of Herod the Great, and was being rebuilt by Herod Antipas, hence Clarke speculates that this could have been seen as a good source of employment by Joseph, a carpenter. The difficulty with the brief quote he will be called a Nazarene is that it occurs nowhere in the Old Testament, or any other extant source. The most similar known passage is Judges 13:5 where of Samson it says the child shall be a Nazirite, where a nazirite was a specific type of religious ascetic. That the Nazirite and Nazareth are so similar in name, while Nazareth isn't mentioned in any other source until after the Gospels have been written, and that the passage almost parallels one about the birth of a hero who was a Nazirite, has led many to propose that Matthew originally had Jesus being a Nazirite, but it was changed to Nazarene, inventing a location named Nazareth, when the ascetic requirements fell foul of later religious practices. Other scholars such as France reject this explanation, stating that Jesus was not a Nazirite and claiming that he is never described as one. Another theory is that it is based on a prophecy at Isaiah11:1 HE, which states there shall come forth a rod out of the stem of Jesse, and a Branch shall grow out of his roots: — the Hebrew for branch is נצר (netzer). The priestly clan of the "netzerites" possibly settled in the place which became known as Netzereth/ Nazareth. Bargil Pixner  in his work "With Jesus Through Galilee" says that the title Nazarene, given to Jesus, alludes not so much to his town of origin as to his royal descent. While this piece of wordplay is meaningless when translated into Greek, Hebrew wordplay is not unknown in Matthew, underlining the opinion that some parts of this gospel were originally written in Hebrew. The Flight into Egypt is one of the listed Seven Sorrows of Mary. A local French tradition states that Saint Aphrodisius, an Egyptian saint who was venerated as the first bishop of Béziers, was the man who sheltered the Holy Family when they fled into Egypt. It is also held that the Holy family visited many areas in Egypt including Farama, Tel Basta, Wadi El Natrun, Samanoud, Bilbais, Samalout, Maadi, Al-Maṭariyyah and Asiut among others. It is also tradition that the Holy Family visited Coptic Cairo and stayed at the site of Saints Sergius and Bacchus Church (Abu Serga) and the place where the Church of the Holy Virgin (Babylon El-Darag) stands now. At Al-Maṭariyyah, then in Heliopolis and now part of Cairo, there is a sycamore tree (and adjacent chapel) that is a 1672 planting replacing an earlier tree under which Mary was said to have rested, or in some versions hidden from pursuers in the hollow trunk, while pious spiders covered the entrance with dense webs. ↑ Von Hagen, Victor W. The Roads that Led to Rome published by Weidenfeld & Nicolson 1967. p. 106. ↑ The subject only emerges in the second half of the fourteenth century. In some Orthodox traditions the older boy is the one who protects Joseph from the "shepherd-tempter" in the main Nativity scene. G Schiller, Iconography of Christian Art, Vol. I,1971 (English trans from German), Lund Humphries, London, p. 124 , ISBN 0-85331-270-2. ↑ Schiller:117-123. The date palm incident is also in the Quran. 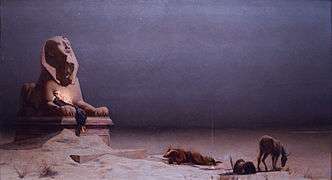 There are two different falling statue legends, one related to the arrival of the family at the Egyptian city of Sotina, and the other usually shown in open country. Sometimes both are shown. ↑ Perkins, P. (1996). Nazareth. In P. J. Achtemeier (Ed. ), The HarperCollins Bible dictionary, pp. 741-742. San Francisco: HarperCollins. ISBN 0-06-060037-3. 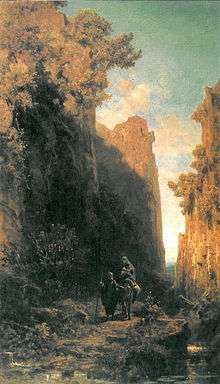 Wikimedia Commons has media related to Flight into Egypt. 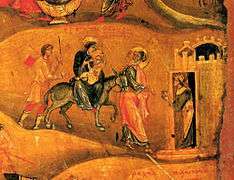 Orthodox Wiki article on the Flight into Egypt Includes map, info and links to various articles and videos on the subject.